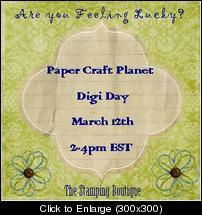 Either way, come and join us at Paper Craft Planet for our March Digi Day! What to bring: The same as always, I think we are all getting the hang of these digi days....bring your coloring tools, typing fingers, snacks, drinks, LUCK...some of us may need some, and cheerfulness! Whats in it for you: Games, free TSB images, fellow crafters, lots of chatting, and some awesome challenges (yes...I'm tooting my own horn).